After a years’ illness, my husband Mike finally took a slightly earlier retirement finishing work on 30 August 2013. Being a very close family and finding our lives revolved mostly around our children and grandchildren, I knew that Mike’s retirement party would be a select group of friends and family. I really wanted to both surprise him and give him a night he would always treasure and remember, so the very secret plans commenced. I remembered that when we saw Gordon Giltrap perform at High Barn in Great Bardfield, Gordon had mentioned that he did private performances for parties etc. We both loved Gordon’s unique performance and his personality came across as amusing and personable. I started the ball rolling by making enquires as to when Gordon would be available to see if it could work in with my plans. We were in luck! Gordon had just one date free this side of Christmas being 2 November, so I very quickly secured the booking knowing that Mike would be bowled over with a private performance to our select little group. We then booked a rather special and beautiful venue being the Guild Hall in the village of Finchingfield Essex. 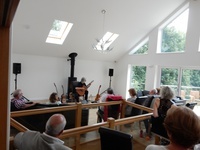 The well-known beautiful village with the pond and historic houses fitted in perfectly with the acoustic sounds that Gordon would bring making it a very special evening for us all. We were amazed that we managed to keep everything from Mike until he walked into the Guild Hall and met Gordon on 2 November!! The food, drink, catering equipment, chair covers, flowers, lighting and decoration all had to be arranged and in place ready for his arrival. Gordon arrived in plenty of time to set up and discuss how the arrival of Mike would go. 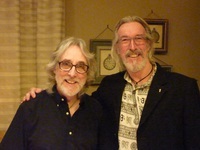 I didn’t want to confuse Mike too much by him wondering if that really was Gordon Giltrap hanging around, so I felt it would be good if on arrival, I arranged for them to meet before seeing the rest of the guests. Mike knew we were going out for his party, and I had assured him he was going to enjoy it. He seemed a little restless during the day on that particular Saturday while my daughter and I were running around with preparations. He seemed a little confused as to why I was not doing the catering at home. However all was revealed when I brought Mike up the stairs to meet Gordon. He was so surprised, a double take took place as Mike digested the realisation of Gordon in front of him while I explained he was to have a private performance. I placed Gordon and his lovely wife Hilary on our table for the meal so that Mike could really spend time and get to know Gordon. This was excellent as he had everyone he loved around him together with his favourite guitarist. All of our family and friends totally enjoyed the evening and said how fantastic Gordon was. Our three year old granddaughter danced her way through the concert in time with Gordon’s beat. But my friends and family couldn’t just leave it there. 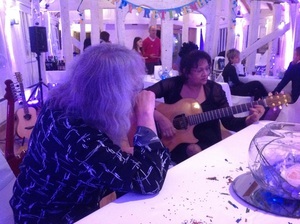 After the concert I left our table for just 5 minutes to find when I came back that my sister –in- law Charmain and business partner Vanessa, were having an impromptu singing session while Gordon played the requested music! So the evening at the venue culminated with a good old sing song while we found ourselves singing ‘Delilah’ of all things! Hilary enthusiastically joined in and a very enjoyable evening, if not unusual for Gordon, was had by all. Did it end there? No of course not. Gordon and Hilary stayed over with us that night and it was such a joy and pleasure for Mike I truly believe that I achieved what I had set out to do. We chatted into the early hours and after breakfast pictures together before we waved Gordon and Hilary off. A truly magical and amazing time was had by all, not least my fabulous husband! Mike kept asking me during the week leading up to the party ‘who is staying in the guest room’ it was a lovely surprise when he found out who. Thank you Gordon and Hilary for a fantastic time.